Save board space without sacrificing performance with HALO's proprietary GEmini series. Available in 10/100, Gigabit, PoE and PoE+ versions. Who's Afraid of a Little Lightning? Lightning strike and power line cross protection for your telecom equipment integrated into one of the industries smallest form factor. GR1089 compliant. Maxim Integrated has released a leading edge 36V H-Bridge driver for isolated supplies utilizing the HALO TGM (1500V) and the TGMR (4500V) transformers. The FastJack series of integrated RJ45 connectors offer PCB real estate savings and reduced manufacturing costs. Available in 10BASE-T, 10/100, GigE, PoE, PoE+, common mode choke, and circuit protection options. A complete “on-board” module for backplane 10BASE2 communications. This compact module enables transmission over a single pair of traces creating a “virtual coax” which significantly simplifies the backplane architecture. HALO designs and manufactures a wide range of IEEE 802.3 compliant LAN product including Discrete Ethernet Transformers, a complete line of integrated RJ45 FastJacks, Common Mode Filters, Token Ring Magnetics, and Fibre Channel Transformers. The GEmini series of high performance Gigabit transformers offers one of the industries smallest footprints. Check out HALO’s TNT (Thin Net Transceiver) for an all in one 10BASE2 (thinnet) solution. HALO is a leading supplier of magnetics for Telecom applications. Product offering includes T1/E1 magnetic transformers, CEPT, ISDN-PRI, T3, DS3, E3, STS-1, E4/STM-1/STS-3/OC-3, ISDN, 56/64/72Kbps Digital Line Interface Magnetics, and Common Mode Rejection Chokes. The Tele-Jack™ series of integrated RJ45’s offers a robust solution for telecom applications where space is limited. For lightning strike and power line cross protection check out HALO’s Telcordia GR1089 compliant integrated Tele-Pro™ modules. HALO offers a broad line of isolated DC/DC PoE and PoE+ transformers as well as isolated transformers for H-Bridge and Push/Pull circuits. 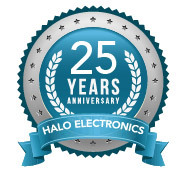 HALO’s line of power inductors are available in drum core, shielded drum core, and shielded molded options. HALO’s line of miniature surface mount shielded digital audio transformers have a broad frequency bandwidth of 10kHz to 200MHz, low Cw/w, and an integrated shield for enhanced CMR performance. HALO offers surface mount wideband RF magnetics ranging from 0.04 to 500MHz in standard 6pin configurations. HALO’s series of 8P8C shielded modular through hole RJ45s are available in Tab-Down, Tab-Up, and Vertical latch orientations with three different gold plating options.